Despite advances, diagnosis of coronary artery diseases with coronary CT angiography (CCTA) is still hampered by artifacts from coronary artery calcium, stents, and cardiac motion. Recent CT techniques have enabled stress myocardial perfusion assessment in patients with ischemic heart diseases. Stress perfusion CT and CCTA can provide information on coronary artery anatomy and flow-limiting stenosis. CT perfusion information enhances the diagnostic accuracy of CCTA and may help to identify lesions appropriate for coronary intervention. 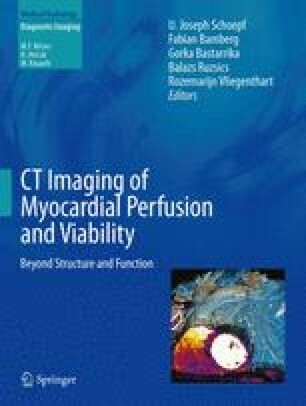 CT perfusion is a potential economic alternative of other functional studies currently used in the evaluation of ischemic heart diseases.